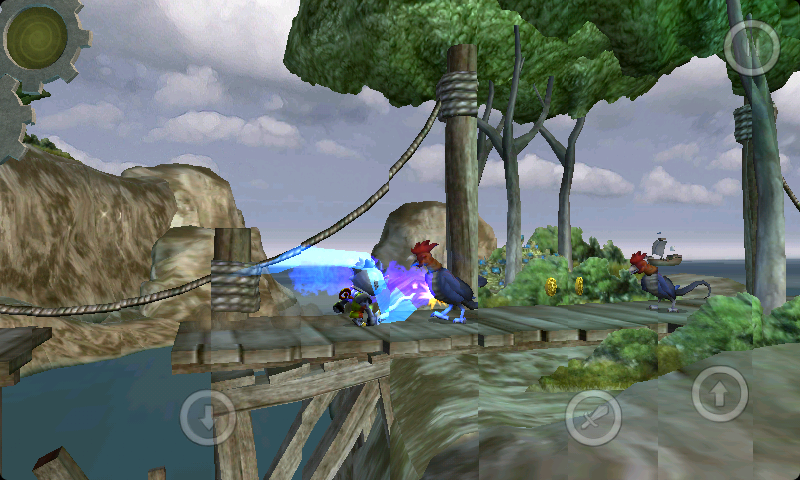 Windup Knight walkthrough is crucial as it is that difficult! 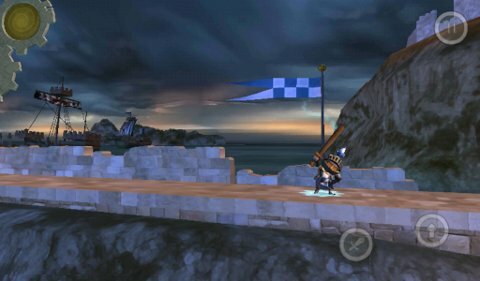 So we've scoured the net to find the best guide for this Android game and thanks to RXWOOKIE of XDA-Developers here is your walkthrough for book one; two; three and four of Windup Knight to help Sir Sprint find all the secret cards. layout as any hesitation will cost you! Book I, Level 1. Disembark Heart card - About half way through the games level you will see a gap you can drop down into without falling into the water. You will bounce off the wall and turn around to go left. The card is hidden under the overhang. You'll know you have it if you see a "?" appear over your character's head. You will automatically bounce off the wall back to the right. Book I, Level 2. Knight Class: Sword Heart card - After the first drop ( you start going left) jump over the gap to a mysterious,hidden area where you will find the card. If you have difficulty finding it- you will find the gap to jump over shortly after defeating your 11th scary enemy bird. Book I, Level 4. Current Events Heart Card - The first card that really needs timing and knowledge of the level. You will know you are getting close when you have a series of sharp drops followed by a series of steps up. At the very top step, after beating your 9th enemy bird, you need to quickly jump a second time to fall in a gap under a wooden platform with a bird standing on it and collect the card. It requires a little timing and agility to get right. The lower wall will open for you to go through. Book I, Level 5. Storm Brewing Heart Card - You will find this card when the level begins to drop and you go back and forth. After defeating the 8th enemy bird, you-ll be running left. Jump toward the wall to enter a hidden area where you will find the card. Book I, Level 6. Roll Heart Card - Easily found between two crates. You will notice that the crate to the right of the card is missing all spikes allowing you to run into it, reverse direction, and pick up the card. Windup KnightBook I, Level VII. Parallel Port Heart Card - As soon as you defeat the 7th enemy bird, begin to roll. Sir Sprintwill drop down, roll back to the left, and pick up the card. Jump out of the gap and continue on. If you find yourself running low on energy, drop into the gap and then start rolling. Windup KnightBook I, Level 8 . Docked Wages Heart Card - I-ll admit, this one frustrated me- I could see the card but not get to it. After beating the 6th enemy bird, you-ll notice a gap under the spikes to the right. You can roll under these spikes and reverse direction. The card is hidden in a box you jump into. After picking up the card, you-ll turn back to the right and continue on. Book I, Level 9. Knight Class: Shield Heart Card - After getting pelted with barrels, you drop one level and begin to meet enemy birds. After defeating the 3rd one, put your shield up and leap. You want to hit the post sticking up to the left where you'll briefly stick and then fall down headed right and land on the platform holding the card. Book I, Level 10. Boardwalk Blues Heart Card - After the first two sets of barrels rain down, press the button to roll under a crate. Immediately press the jump button and you'll sashay through the next one and pick up the card. Book I, Level 11. A Shore Thing Heart Card - After beating the second enemy bird, you-ll roll under a box and need to immediately jump into a hollow box and up two platforms to get the card. Windup Knight Android Game Book II, Level I. Scenic View Spade card - The second time you have to roll under a spiked wall, you will see the card clearly visible at the exit. Jump immediately when you pop up to get the card, swing your sword while you are in the air and as soon as you kill the wolf, drop into another roll. Book II, Level II. Bring the Heat Spade card - Very easy to get, the card is floating in a jet of flames (best use of a flame trap in a Smartphone game? )just prior to the end of the course. Hold your shield up and jump to get the card. Book II, Level III. Knight Class: Double Jump Spade card - After you defeat the 7th enemy of the level, you-ll jump up to a rickety platform. From here, jump off and allow your knight to fall a little before performing the second jump. As soon as you land, you need to roll under the spikes to get the card. Alternately, you can just run off the platform and do a double jump to land on the lower level to roll to the card. Book II, Level IV. Two Steps Back Spade card - This card is fairly well hidden. You will want to beat the first 4 enemies. Then you will roll under a few walls and begin a short series of climbing jumps headed left. There is one large jump down and over a lot of spikes. When you land here, do not immediately roll under the wall to your left. Allow your knight to bounce off and then roll under the spikes to a hidden area where the card is waiting for you. Book II, Level V. Collapse Spade card - This card requires a bit of timing. As soon as you beat the 5th virtual enemy on the level, after a series of double jumps up and over spikes, you-ll want to perform a double-jump into a roll over a large series of spikes. This will cause you to roll under an enemy bird and collect the card. the game coins and found the hidden cards? Book II, Level VI. Knight Class: Wall Jump Spade card - This card is found by wall jumping up to a hidden area and rolling under a wall of spikes. During this level you-ll go through doors that will drop shut behind you. The second door that drops is your signal to repeatedly wall jump up to find the card. Book II, Level VII. Spiked Punch Spade card - You just need to follow the level along until you reach a series of three jumps over trap doors. You will notice the second one actually has an opening in the spikes beneath it. Keep this in mind, but you need to continue on for now. You will quickly come to a wall leading down to the flag with 4 coins on it. Jump on the wall and get the 4 coins, then wall jump off to the left. At this point, you want to fall down through the second trap door to find the hidden card. Book II, Level VIII. Tourist Trap Spade card - You'll run through this level and beat 5 enemies. After that, you-ll roll under a wall, block some boulders, and roll under another wall before you see a set of steps with an enemy bird on the second step. You need to defeat the enemy bird, bounce off the wall to the left, double jump up to where the card is and jump once more to get the card. Slide down the wall through the trap door and you'll resume the level going right. You'll need some slick and quick fingers on your Android screen to get all these jumps and slides right! Book II, Level XI. Roll with the Pack Spade card - You-ll see this card clearly when you roll under a wall and immediately have to defeat two enemy birds. Roll on under the next wall and defeat the wolf. Now you can bounce off the next wall (no spikes), roll back to the card, get it, bounce back to the right and continue on. Be sure you do not double jump or roll too much because you are going to run your energy level really far down. You might experience a few -wind downs- and if that happens, you are spending too much energy jumping and rolling. Remember to persevere and even though there are no checkpoints in Windup Knight , luckily there are unlimited continues! Book II, Level X. Construct Spade card - This card is easily the toughest you-ve collected so far. In this level, there are two large descents where you have to jump from wall to wall to avoid spikes and collect coins. On the second one, you jump and slide on the right hand side and then jump to the left to collect coins (and avoid spikes). You need to jump just under those spikes so that when you land, you are headed to the left. Roll into a secret room where the card is located. That-s the easy part! Once you are rolling into the room, you need to release the roll button on your phone and get ready. Here's the sequence- double jump to middle wall, wall jump to right, wall jump into a double jump to left and over middle to collect card, slide down far left wall, wall jump off into a double jump at the key over the spikes, roll back out of the secret room. Exhausted and with your fingers numb from all that Android screen tapping you can finally continue on! Book II, Level XI. Erosion Spade card - As you are running along, beat 3 enemies. After this, you will soon roll under a spiked wall and collect some coins before seeing a spiked pit in front of you. Jump and roll while in the air to drop into a hidden room underground. You-ll need to block flames and kill enemy birds but the card is yours for the taking. You-ll need to double jump over the spikes and put up your shield to get it. Book II, Level XII. Grotto Spade card - This card is easily visible once you are in the underground. After collecting the key just roll into the room, pick it up, and roll out. Book III, Level II. Troll Bait Diamond card - At the beginning of the level, jump the first pit of spikes, and then double jump up the next wall and go backwards. You will then need to wall jump up to find the card. Once you get the card, just slide down the wall and continue on to the right. Book III, Level III. Deep Pockets Diamond card - After beating two enemies (a bird and a wolf), you-ll roll under a set of spikes and climb a short wall. At the top of this wall, step off to the right and double jump up. This will put you on top of a platform to immediately roll under some spikes. At this point, rapidly wall climb a chute and over the top collecting a key as you go. Drop down the other side, avoiding the spikes to get to a small room with spikes top and bottom where the card is hiding. The trick to getting over these spikes is to jump a little early on the first jump. Hit the jump button on your phone just before landing each jump afterwards and you-ll make it. Once you collect the card, jump over the spikes again, roll out and continue on. Book III, Level IV. Bridge to Nowhere Diamond card - For some reason, this card eludes a lot of players. As you are going along, you'll see the card beneath you with no apparent way to collect it. Here's what you do- once the card is coming up (located at the bottom of the screen after beating your sixth enemy), you-ll be on a wooden platform with two coins. Just run right off the platform and fall down. Jump once and you-ll get the card. Double jump after getting the card and you'll continue on. One of the most hidden secrets in an Android game? Possibly! Book III, Level V. Friction Diamond card - After one long descent, you-ll need to wall jump back to collect the card before continuing on. It-s clearly seen and fairly easy to collect. Book III, Level VI. Prison Sentence Diamond card - This card is found back to the left of the initial starting point over several trap doors. If you run across the trap doors, they will all collapse leaving you no path back to continue on the level. You have to double jump across leaving every other platform intact. Start by double jumping over the first platform to the key, then repeatedly double jump until you reach the concrete platform with the card leaving every other platform intact. In doing this, you-ll also end up jumping over a second key, that-s what you want to do. Get the card and reverse direction back to the right. Double jump to the platform with the key you just skipped over, collect it, and keep on double jumping back to the level itself. Roll under the spikes and get ready! * Hint - At one point, you roll under a wall and hit a trap door. If you notice, there are a few coins you-ll miss at this point. To get these coins, you need to release the roll as soon as you are under the wall and begin tapping the jump button like crazy. If you are lucky, you-ll hang to the wall and then jump over to the coins. Keep trying and you-ll get it! Book III, Level VII. Shut Your Trap Diamond card - After beating the first three wolves, you-ll double jump out to collect some coins and land on a series of three trap doors. Make it across all three to collect the card on a high ledge and continue on. Book III, Level VIII. Solitary Confinement Diamond card - Near the very beginning, you-ll collect a key. As soon as you collect the key, look for a wall to your right. Double jump up the wall, then wall jump back to the left into another double jump. Work your way up to the card (and another key) and continue on. Book III, Level IX. Knight Kabob Diamond card - You-ll be traveling along to the right and reach a point where you have to wall jump back and forth to collect six coins. Once you are at the top, you-ll collect a few more coins and a key. As soon as you collect that key, wall jump off the next wall to go back to the left. Double jump up and over the gap to a hidden area with spikes that pop up to collect this card. Book III, Level X. Alternatives Diamond card - You-ll clearly see this card beneath you near the front of the level. To get it, you need to jump up on the next platform, block the falling boulder, roll under the spikes to bounce off the wall and jump down. * Hint - This level is all about choices. You need to keep your eyes open for the best path. It-s the one that leads you to the coins. Forget about everything else and keep this in mind as you are going along. Book III, Level XI. Medieval Knievel Diamond card - This card is found near the end of the level where you are rolling under spikes and jumping over other spikes through flames. In one of these rooms, you-ll double jump over some spikes (through two flame jets) and land to kill an ogre. Put your shield up and wall jump off the next wall back to the left. Travel back over two sets of spikes to find this card high up on a wall. Collect it and wall jump back to the right and continue on. Book III, Level XII. The Shaft Diamond card - This card is located in a small room off to the right of the main shaft. You have to jump in, roll under some spikes (release the roll button once you are under the first spike), jump over the next spikes, wall jump back and then up to the card. Continue on to the right, down and back out into the main shaft picking up a key as you go. One thing that helped me is to not double-jump over those first spikes. Instead, just release the roll button as soon as you go under the spikes and get ready to tap the jump button once as soon as your Knight pops up. * Hint - Most of the time you can make it across the spikes in the main shaft to the other side with a single jump. If you double jump too often, you-ll end up winding down. At the bottom of the shaft you do need to be on the right side so you end up headed left to collect the last few coins. need to have mastered jumping in the game! Book III, Level XIII. Third Nightmare: Sidetracked Diamond card - Near the end of the level, after you-ve beaten all the enemies you-ll reach a wall that has spikes on one side and nothing on the other. At this point you-ll see a wall to your far right with spikes sticking out on two upper levels, but not the bottom. Roll under these spikes to reverse direction and jump up to where the card is hiding under a flame jet. All Diamonds Reward: Diamond Sword (free) - Fires a missile of energy that penetrates through enemies and keeps going until it hits a wall or goes off screen. Very useful in Book IV! Clubs card - You-ll find this card at the far right hand side of the upper level. You can get it by double jumping up and defeating some knights. * Hint - To get all of the coins, you-ll need to jump up against the left wall after getting the card then back to the little ledge in the upper right. Allow your Knight to slide down and you-ll collect the coins on the right hand side. Also, there are two coins hiding between sets of spikes that I missed for the longest time during a longer slide down a shaft a little bit later. Clubs card - This card is visible on the right side of a closed door as you begin to wall jump back and forth up a passage. Once you reach the top, you-ll come to a descent with coins on the walls. After you collect the coins on the left-hand side, jump over to the right and drop down. You-ll end up headed left and collect the card. Clubs card - This level slowly spirals inward counter-clockwise. This card is found in the upper right corner of the second passage leading up. To get it, bounce off the little step to the left and wait as long as you can to double jump to the right. Wall jump back to the left and defeat the knight to continue on. Clubs card - Near the end of the level, you-ll beat two wolves and a door will open and slowly close behind you. Jump over the spikes here and back to the now closed door to climb up to where the card is. Clubs card - In the beginning, after beating two knights and jumping up a few steps, you-ll reach a shaft going up. Jump to the wall on the right and let your Knight slide down the wall and off the bottom corner. You-ll fall into another, semi-hidden shaft. As soon as you collect the key on the left, press the jump key to connect to the wall and jump over to the right side where the card is. Slide down again and collect the card, then jump out of the hidden shaft. To get into the main shaft and back to the level, you need to double jump over the spikes. Clubs card - This card is located about midway through the level. You-ll roll under a crate and see a set of spikes sticking up and a wolf that you-ll have to kill if you jump over the spikes. Instead, bounce off the small wall under the spikes and double jump back up to the left. Double jump over to the right to collect the card. Clubs card - This card is found just after beating your third enemy. You-ll jump and slide down a large wooden wall, head off to the left and roll into a secret room. To get the card you follow the same method used to get the coins below walking level. Allow the Knight to run off the platform and just a second later jump back up. Bounce off the wall into a roll and you-ll just barely coast under the spikes with the card safely in your possession. Clubs card - At the end of one passage headed right, you-ll jump up two steps. From here, jump to the left, bounce off the small wall, double jump to the right hand wall, wall jump into a double jump off to the left and continue on. Clubs card - At the end of the first gauntlet of spikes, you-ll see a change in the floor to wood. Double jump at the end up to the hidden area with the card. Clubs card - This card is found at the bottom of a long shaft you slide down and is found in a fashion very similar to that of Book II, Level X (Construct). Near the bottom of the shaft, jump under the spikes to the right so you land headed to the left. Roll into the room, kill the troll, get the card, and roll out. Clubs card - This one is tricky. Near the end of the level, after the quick succession of spikes that you have to roll under and some that pop up, there are 2 wolves. After them is a trap door that you have to fall down through. As you are falling, double jump to land on the platform below. Immediately roll, pop up and get the card, roll again, and then double jump out with your shield up because you are going right into a falling barrel/rock. Clubs card - This card is initially difficult to find. You-ll notice about half-way along that two sets of spikes don-t go all the way to the ground. As soon as you are clear of them, you need to put up your shield and jump through the flames to reverse direction. Use the platforms above the spikes to jump up like stairs and get the hidden card. Clubs card - When you go up the triple height / 3 level shaft (with spikes and birds), do a double jump off the very top and you will just reach the card. * Hint - Try playing this one with your phone upside down. If you are having trouble with the second set of spikes- Double jump to the first wall. Do a quick double tap jump to the second wall. If you did it right you'll be at the very top (or bottom if you count it as upside down), jump again and just before you miss or hit the bottom of the next wall, tap for double jump. You should be around the middle of the third wall now. Tap again to hit the 4th wall and then normal double jump over the spikes. All Clubs Reward: Clubs Shield (free) - works like Magnet Shield AND Medusa shield in one... Use this shield to help you achieve S rank on other levels- just keep it up at all times and coins will fly to your location (AND) enemies will turn to stone that you can run right through! Other hints and tips: Spend your notes wisely , even though Sir Speed will find in game purchases like the Magnet Shield useful, the game can still be completed without them. If you don't pay for the additional books of Windup Knight they can be unlocked on your Phone for free by getting an 'S' grade on virtually every level of the previous Windup Knight book. This is truly some old school gamimg on your Android , but very addictive and definitely an idea of what a good Smartphone game should be. Once again many thanks to RXWOOKIE for this brilliant Android game guide. Diamond card - This card is found near the end of the level where you are rolling under spikes and jumping over other spikes through flames. In one of these rooms, you-ll double jump over some spikes (through two flame jets) and land to kill an ogre. Put your shield up and wall jump off the next wall back to the left. Travel back over two sets of spikes to find this card high up on a wall. Collect it and wall jump back to the right and continue on. The clubs shield that I got on my kindle fire did not act like a magnet/Medusa shield! Is it different on an android? If you don't pay for the additional books of Windup Knight they can be unlocked on your Phone for free by getting an 'S' grade on virtually every level of the previous Windup Knight. I played the whole game without spending money. Definitely true. The problem Anonymous, is that you are retarded. Actually im not retarded and I have s grade on all books including the secret one and I cannot get the 2nd book even with my 1200 notes...please help! Windup has been known to have bugs in the past; try updating the game.If that doesn't work then Gametrender will help find a solution. Another strategy for Book III, Level I (a modification of the long way): do a double jump over the dragon-chicken thingy and collect the coins. Then, jump off of the tall wall and kill the bird on the way back. Since the bird gives a tiny wind-up boost, this helped me. You have NO idea how helpful this is. I couldn't have gotten/found many of the cards without you. This game is awesome, one of the few that's kept my interest. I'm on 4-8 and can't wait to find out how it ends. Thank you! The guide has been very helpful. I got an s rank in every level before I moved on to the next. Now I'm just working on last level, the fourth Nightmare. However the books do not unlock if you get an s rank on every level...because I did on every book before moving on to the next and I still had to buy with my notes. If that was the case at some point they fixed it in a update. Luckily I haven't bought a single item from armory, I just use the items given to you from the cards. So I had the notes to open the other books. I would have had a tough time finding some of the books, ty for your guide. Always a pleasure Ryan, gaming is what we do. Congrats for being a super tough as nails gamer to make it all the way through this difficult game. We still haven't seen anything quite like this game in recent times and it definitely needs its own hall of fame. What sort of guides or articles would you like to see on Gametrender next? Just finished the game with S ranks across the board. Only need the no coins coin and kill no cockatrice coin. Anyone know which levels these are possible on? the no coin is possible on book 3 lvl1 , especially if u have the clubs shield, which by the way, preventsthe knight from winding down when the shield is up. finishing without killing chicken is pretty easy when u got the double jump avaiable. i finished the whole game now (without this guide),and got all medals except for the last secret medal on the right, which i dont know what it is ;) anyone knows? The last secret medal on the right is "You walked the plank in Docked Wages!" Docked Wages is Book I Chapter VIII. At the very beginning, kill the cockatrice and then don't roll. You'll hit the wall, turn around and keep walking left until you drop off the plank. "All Clubs Reward: Clubs Shield (free) - works like Magnet Shield AND Medusa shield in one..."
I'm not sure if this was true in a previous version, but having just S-ranked every level and gotten the shield, I can say that it's certainly not true anymore. The shield prevents you from winding down while you're holding it up. You should update your guide to avoid misleading anyone else. You should also clarify that the extra books are not "unlocked on your Phone for free by getting an 'S' grade on virtually every level of the previous Windup Knight book." This implies that the books are automatically unlocked as a reward for getting S-ranks, when in fact getting 100% S-ranks simply gives you enough notes to unlock the books without paying cash. If you buy a single item from the armory you will no longer have enough notes to unlock the next book. Any tips for book IV level 12? I'm stuck with the falling spiked ceiling it always caught me.